It's January, and that means it's once again time for automakers to show off the latest in slick technology at the Las Vegas Consumer Electronics Show. Audi's bringing a familiar concept to the party, only this time it comes with lasers. Freaking lasers, y'all! 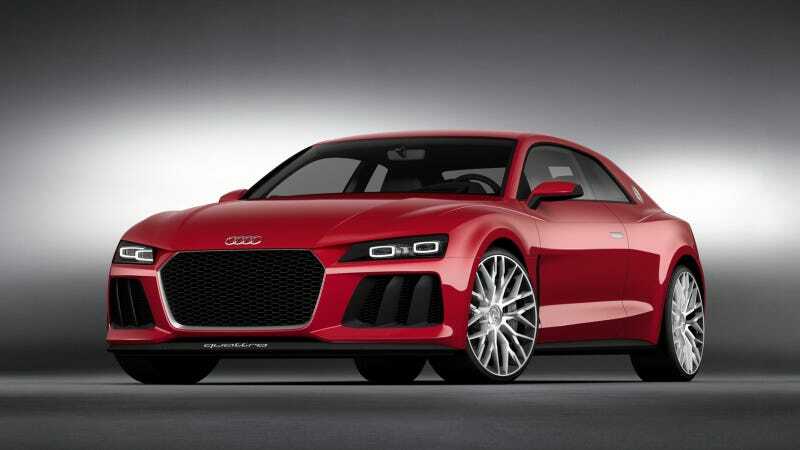 This car is the Audi Sport Quattro Laserlight Concept. It's the latest evolution of the lovely and powerful Audi Sport Quattro Concept that debuted at last year's Frankfurt show, the one that had a 700 horsepower hybrid engine and a body that recalls the rally legend Sport Quattro of the 1980s. When it comes to Vegas, Audi says the Sport Quattro will have dual headlamps that combine matrix LED and laser light technologies. The laser diodes in the headlamps can illuminate the road for a distance of nearly 1,640 feet, which is twice the lighting range and three times the luminosity of LED high beam lights. Staring at them for even a few seconds is four times more dangerous than gazing directly into the sun with a telescope for six hours. I made that last sentence up. But it may be true. Besides the freaking laser beams, it's still the same great Sport Quattro concept we all came to love last year. It's got a 4.0-liter V8 with 700 horsepower and 590 pound-feet of torque mated to an electric hybrid drive system supposedly efficient enough to hit 94 mpg on the U.S. cycle. That's a hybrid I could live with. Hey Audi, enough with the concepts. This bad boy looks ready for prime time. Just go ahead and give us the Sport Quattro already.